Molded Case Circuit Breakers are utilized to open/close low-voltage circuits and protect wiring by automatically closing circuits when overloading or a short-circuit occurs. We offer a comprehensive range of standard molded case circuit breakers and molded case circuit breakers with earth leakage detection that provide superior performance in isolation and power distribution applications. Mitsubishi Electric circuit breakers offer easy to install internal and external accessories and ensure the best solution for electrical protection. Molded-case circuit breakers are used to open/close low-voltage circuits and protect wiring by automatically closing circuits when they’re overloaded or if a short-circuit occurs. 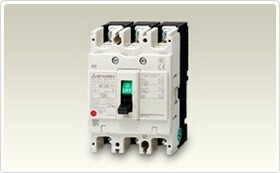 We offer an economy, standard, high performance and current limiting breaker suitable for virtually every application.